How does it feel living in a toilet? Well this Chinese family managed to turned an abandoned toilet into a cozy living place even they don't have a golden toilet like this one, at first due to the poverty this Chinese guy named Zeng Lingjun couldn't afford to rent a house in Shenyang China. Here's the full story. Six years ago, a friend tipped him off that an abandoned hotel toilet was available for rent at a very low price. He immediately borrowed the money he needed and rented the derelict toilet as his new home. He took down the old door and all the wooden cubicles, and laid down some planks to cover up the toilet bowls and make room for a bed. The dismantled cubicles were converted to storage space and, even though the place is just 19 square meters in size, he somehow found space for his own little cobbler workshop. In 2008 Zeng Lingjun met his current wife, also a migrant worker. They married in 2010 and had a baby shortly after. Now the three of them live in the abandoned toilet. At one point, they saved enough money to move into a normal 80 square meter apartment, but they found themselves coming back to their old home just days after they had moved out, unable to afford all the expenses. Although the smell never lets them forget they live in a toilet, Zeng and his family just flush the toilets whenever the stench becomes unbearable, and just enjoy their life together. It's sounds weird right? 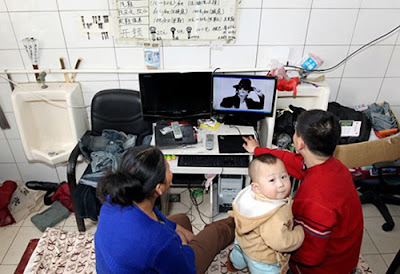 Here's more photos of This Chinese family who live in an abandoned toilet. see how he put his PC in the middle of the urinal. How do you think?